Gov. Paul LePage speaks to reporters after his remarks at a campaign stop in Scarborough on Friday. AUGUSTA, Maine — The re-election campaign for Gov. Paul LePage announced Sunday afternoon that LePage, a Republican, would participate in five scheduled debates. “This decision has come after much reflection over the past week on the value in debating Congressman Michael Michaud, who has continually been dishonest with the Maine people about Governor LePage’s stance on Social Security,” a press release issued by LePage 2014 stated. Lizzy Reinholt, communications director for Michaud for Maine, said the Democratic candidate was not surprised by his opponent’s decision. The spokeswoman for independent Eliot Cutler said Sunday that the candidate wanted people to watch the debates before voting. Alex Willette, communication director for the LePage campaign, said that the governor will take part in following debates on the following dates: Portland Regional Chamber of Commerce, Oct. 8; Mid-Maine (Waterville area) Chamber of Commerce, Oct. 9; Maine Chamber of Commerce, Oct. 15; WGME, Channel 13, Oct. 20; and WMTW, Channel 8. The Bangor Daily News will live stream the WGME debate on its website. LePage said late last week he was re-evaluating his decision about whether he would participate in the debates. On Sept. 22, after a group that supported Michaud aired a commercial accusing LePage of calling Social Security “welfare,” LePage said he would not take part in debates unless Michaud’s campaign apologized. On Friday, the governor told reporters he would attend the debates but would not take the stage. 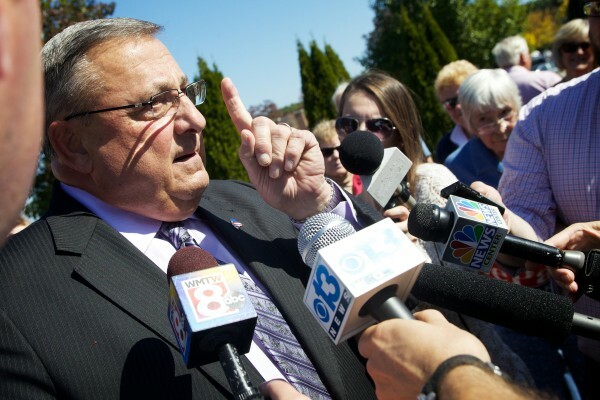 “The Maine people deserve a leader as their governor, not a follower,” LePage said in the press release. “It is a sad state of affairs that Congressman Michael Michaud is failing to step up to the plate and be honest with the Maine people. The controversial “welfare” comment was made in June after Democrats had been proclaiming Maine ranked 49th in personal income growth, citing figures from the U.S. Bureau of Economic Analysis. The figure was used in attacks against LePage, who has campaigned for creating jobs and decreasing unemployment. In a press release issued in June, LePage said the Bureau of Economic Analysis was inflating personal income figures with “welfare” payments, including Social Security, according to a previously published report.